Dan is the CEO of Clark International, which provides protection, security, and training to an unparalleled clientele. Headquartered in Omaha, NE for over 20 years, Clark International draws from the cumulative knowledge and experience of decades of law enforcement, PSD and military operations. 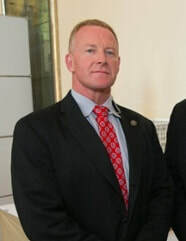 Dan Clark is one of the top executive protection specialists in the business. His company now employs about 150 and has safeguarded the likes of Sarah Palin, George Clooney, Barack Obama. Dan Clark, a provides protection, security and training to an unparalleled clientele. His years of experience and over 15 year partnership with McKay Landscape Lighting provided attendees with tips and a different prospective on designing for residential security lighting. Hear different sales strategies from your peers and the "difference makers" that have helped them grow along the way. From managing employees to controlling an influx (or decline) in sales to everything in between, things can easily get out of balance. We'll discuss some common struggles and share ideas for bouncing back. This dynamic panel of experts will share their unique business strengths and knowledge with the group. "I can't say enough great things about The Lighting Summit and the McKay [Lighting] group. I have finally found a group of people that share the same passion and truly care about the growth of our industry. The friendships I've made and the knowledge I walk away with each year are worth every penny of the conference. Jerry and his staff understand the needs of Lighting Professionals and continue to outdo themselves each year. The Lighting Summit energizes me to push our company to become better and better. Thanks so much for another great conference, I'm more motivated than ever!" "Once again The Lighting Summit was a great experience. The interaction between attendees is always fantastic and talking with Jerry and his team provides information on how to run a successful outdoor lighting business. Many thanks." "Getting together with a group of like-minded people to discuss business, in a very unique industry, is a rarity. The beautiful thing about The Lighting Summit is the space it creates for people to come together and help one another improve and grow their businesses. We keep coming back, not only because of the incredible impact attending it has had on our company, but also because of how great Jerry and his team at McKay Lighting have been sharing their experience with others. I’d highly recommend The Lighting Summit to any lighting designer in the landscape lighting industry looking to better their business and improve their outlook. Thank you so much for everything ya'll do!" "Another great Summit. It was my 3rd year attending and the best one yet. I am energized to make 2018 the best year ever. Thank you so much to Jerry and his staff for rolling out the red carpet. " "This is the third year I have participated in Lighting Summit and it was the best so far. The amount of useful ideas and suggestions to be gained from McKay and others in similar businesses never runs out. In addition to all the business related benefits, it was a blast hanging out with some really great people. I highly recommend it."